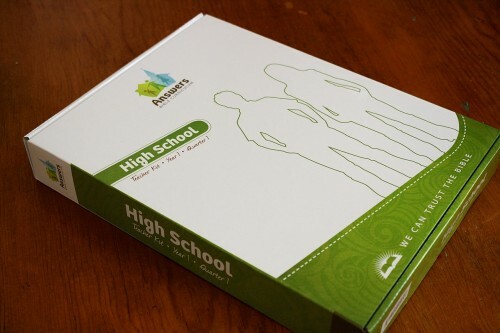 ~Disclosure – Our family received Answers Bible Curriculum High School in exchange for an honest review. All opinions are my own. And just so you know – we love Answers in Genesis! Please read our disclosure policy. Plus, don’t miss the giveaway at the end! 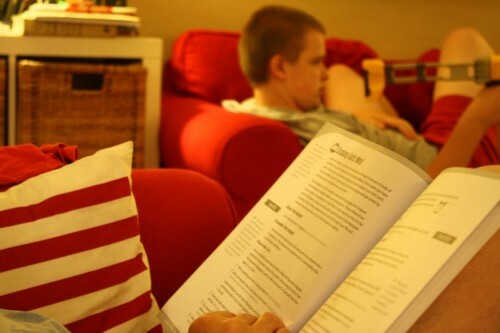 Yes, we study the Bible as a family, we often have an evening devotion time. We carefully choose curriculum that is Christ-centered. We attend a Bible-believing church and Sunday school. But I had, in my heart, been searching for something just for my young adults. A challenging resource, rich in learning. A resource we could partner with in our parenting. Mission: Answers Bible Curriculum was developed to present the gospel, beginning in Genesis, to all generations; to train believers to know, obey, and defend God’s Word; and to encourage believers to become conformed to the image of Christ. 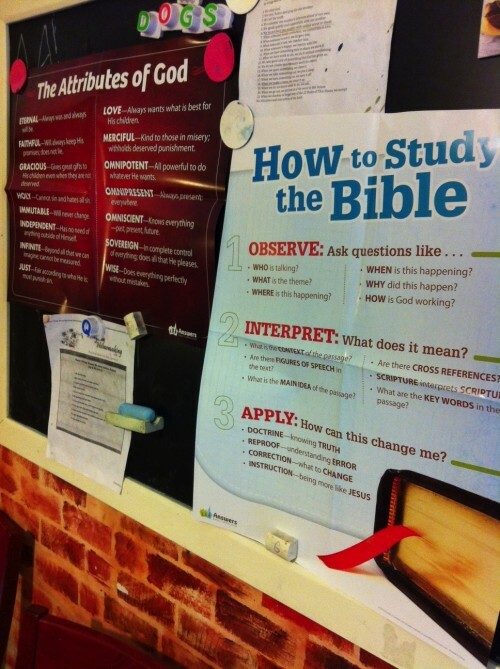 What does Answers Bible Curriculum (ABC) High School Include? I am reviewing the high school level curriculum but I want you to know that Answers Bible Curriculum is for all ages and is available for different age levels. In fact, my fellow bloggers are reviewing these. You can visit the Creation Museum site to view all the links to Answers Bible Curriculum reviews. 1. Student Guide – a quarterly book with lesson background information, class notes and personal application questions. 2. Teacher Guides – includes background material, detailed lesson plans and optional activities – making the lessons easy to teach. 3. DVD-ROM – with all the extras like in-class worksheets, videos and teacher helps – all ready to print. You might be wondering how a curriculum designed for Sunday school would work in a homeschool. Yes, this is a Sunday school curriculum but why not use the best Bible curriculum and adapt it to your homeschool needs? Let me share with you how we have been using ABC. 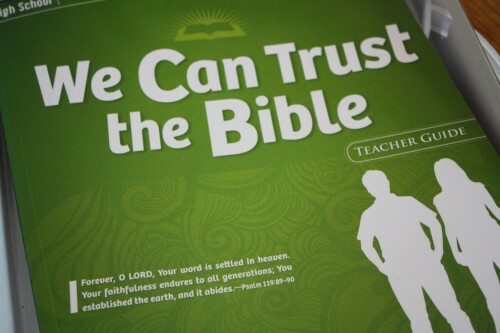 When we first opened the package, I pulled out the We Can Trust the Bible student guide and read the introduction aloud. That got my high schoolers’ attention (as well as the rest of our children – kindergarten, second grade and sixth grade). We have two high schoolers – a 10th grade girl and a 9th grade boy. Each have different learning styles. So reading the student guide and studying the posters appeals to my visual learner. While hearing the lesson and discussing the topics helps my auditory learner. My husband was the one that introduced me to Answers in Genesis resources years ago, so naturally he was interested in ABC. Because of his interest, we have shifted our reading of the lesson to family devotional time. He reads the lesson and the discussion questions prompt wonderful talks that all our ages contribute to. We also found that rather than do one lesson all in one evening that it was best to spread out the lesson over the week, discussing key concepts. This offers everyone a focused discussion on topics, practice in looking up Bible verses and reading aloud. A chance to share thoughts. Does it sound like we’ve turned this high school Bible study into a family study? Yes we have! But the student guide offers my high schoolers independent study time during the week which I feel is important in our young adults’ lives. Remember I said I had been searching for something just for my young adults. 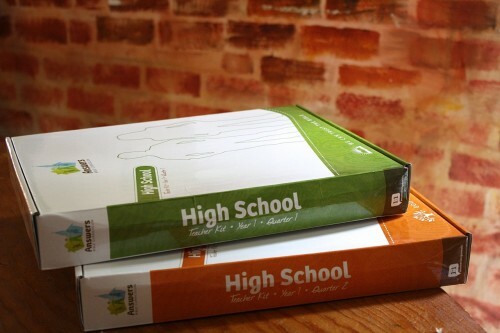 With quarters 1 and 2 of the high school level ABC study, our high schoolers will continue to have rich Bible learning. Quarter 1 is foundational for understanding the Bible and the character of God. This starting quarter offers the framework for understanding Biblical history. Quarter 2 builds upon that foundation, walking through the Bible, starting with creation. 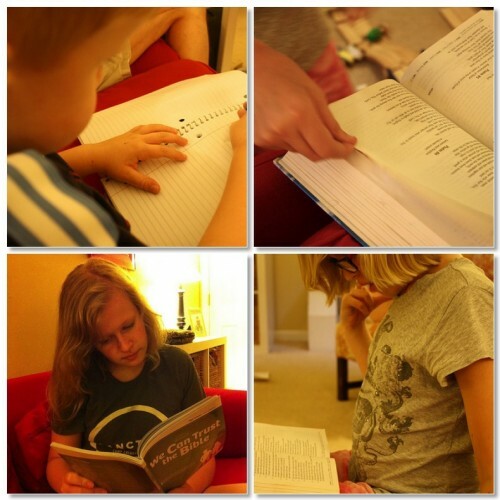 We look forward to more family devotion time as well as in depth Bible study this year in our homeschool! What Does Answers Bible Curriculum Teach? What are the Key Concepts? I also know that Answers Bible Curriculum would be great in a Vacation Bible School setting as well as in regular Sunday school and small groups. View a video of frequently asked questions. Again, if you’d like more detail about the grade levels available, my fellow homeschool bloggers are reviewing all the different age levels of Answers Bible Curriculum – find their links at the Creation Museum site. 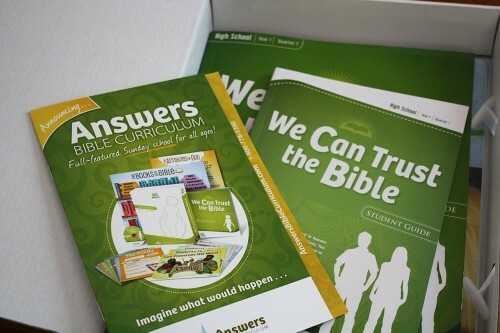 Now for the Answers Bible Curriculum Giveaway! One winner will receive ABC Sunday School Quarter 1 & 2 (level is winner’s choice). Just follow the instructions in the rafflecopter widget below. Homeschooling for over a dozen years now, Tricia faces a daily dose of chaos with five children from preschool to high school. She shares a mixture of art lessons, recipes and helpful homeschool habits at Hodgepodge. She and her husband, Steve (who writes app and technology reviews), are co-owners of Curriculum Choice. We love AiG. This looks really good! I am most interested in Jr. High and Grade 3&4. Our church uses some Answers curriculum for the youngest two groups but this looks very interesting for our high schoolers! I am most interested in the 3-4 grade. I love Answers in Genesis! I would use it for our Bible lessons. I saw it at a curriculum fair and it impressed me. I am interested in grades 3-4. 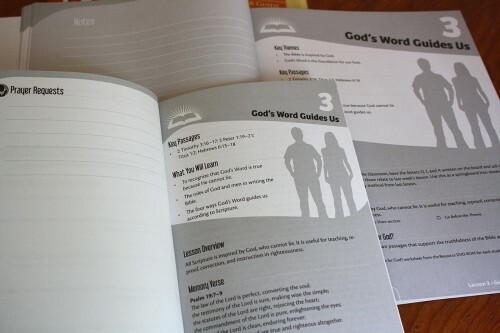 We have used some of AIG books in our homeschool, and this looks like fantastic Bible curriculum! I need three different levels, but I think I’d mainly like to focus on the high school curriculum this year for my daughter. Everything from AIG is great! I’m sure this is no different. Thank you for this review. I love Answers in Genesis, but often wonder how adaptable some of their products are for homeschooling. We would definitely use it as a family devotional tool. I am interested in the high school level. 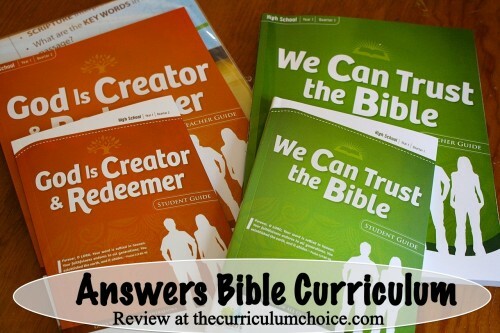 We have used the elementary level of Answers Bible curriculum and loved it. My daughter would ask to do more lessons all the time. The high school level would be great for my son. I always look forward to reading/ presenting any of AiG’s materials. I have been stuck finding a Bible curriculum for my son. Now that we are going into grade 9 something meaty would be nice. As a former Sunday School teacher I can remember enjoying the way the lessons were laid out. I would be interested in the elementary version and we would probably use it as a family devotional. thanks for the giveaway! I LOVE AIG’s science and would love to try this out! Love AIG! Planning on using their History curriculum this year. I think a Bible curriculum geared towards my 7th grader is what I’d like. Thanks, Tricia! I have been looking at ABC with great interest! I had been looking at this a bit… we would use it for our homeschool Bible class time (which means family devotion time) and we would use the elementary version. thanks for your review!! I would probably lean toward the high school level as I have a junior and twin 8th graders. One of our favorite memories is the Creation Museum! We would love a High School Curriculum! This looks like wonderful stuff for my kids! This looks great for my high schoolers. Thanks for the giveaway! I would use this either as our Bible curriculum during school time or as family devotion material during breakfast. With 4 children 5 and under, the preschool level would work best for our family this year. This sounds wonderful…hoping to add it to our homeschool this year! Love AIG and would love to try out this curriculum! I think I would try the Junior High pack because I could probably include 3 of my kids in it. We would use it 1-2x/week for our “school” Bible time. All I know right now is that we’re doing a “Missions Monday” to cover Bible, missions and geography! Thanks! That sounds exactly like what I would love for our family! My DD is 5 and son 10 – I’ve been looking for something systematic and challenging! We would probably use his curriculum for a family devotion as well as a bi Bible course for our third grader. I have a 5, 3, and 1 year old so i would use the firsy kit. My husband and i love ken ham and trust his literature. What a great resource! I love Answers in Genesis, and am most interested in the grade 3-4 level. I would love to use it for our morning bible study. We would love this for our kids. We would use this as our Bible lesson in the mornings. We would need the youngest lesson. I’m looking for a Bible curriculum to use with my 6th grader and my 20 year old. I’m doing a Foundations bible study locally right now and would love to get the curriculum for my girls – they are elementary age. My eldest two are watching Foundations DVDs with us and get a lot out of it, but I’d love to use the curriculum with them too! We would love the preschool. We have always prayed as a family and read children’s Bible stories, but have not actually pulled out the real Bible… Kind of embarrassed! I think this is a great curriculum. I would love for the junior high level. Thanks for sharing. I’d love to have a Bible curriculum that would allow all three of my kiddos to use together. I’d probably begin with the 6th grade curriculum. I have felt drawn to this curriculum since I came across it a few months ago. I would love the PreK-K curriculum. I’m so glad to find reviews of this curriculum. I would use this as our science. I am often worried that I don’t have the correct answers or the right explanation for our sons when questions come up. We would begin with Quarter 1. Thank you for the chance to win. I would use it for Bible study with my teens, who range in age from 14 – 17, so I would want the high school level. I would use it as a Bible curriculum for my 4th and 1st graders and try to get it into our Sunday School. I would be interested in elementary levels. We love AIG! This would be a great family devotion, esp. for our older children! My daughter works w/all non-believers, so this would be helpful to her as she tries to share with them. My interest in AiG has been piqued by reading the comments at Hodgepodge and the reviews here. We would integrate the jr high level of ABC into our family’s evening devotional time with children at the 8th, 5th, and 1st grade levels. Our oldest (college) & her husband might even be pursuaded to join us for some hearty discussion! I would love them all but probably high school. Looks great! I have been looking for a Bible Study curriculum for our family and this sounds like it is the one. I would like upper elementary level. I would use this with our daily breakfasts. We need a great way to start our day. I would use it for my homeschool Bible curriculum. I would want the level that covers 6 year olds .Thanks. I would use the 5th and 6th grade level and we would use this a Bible study for my two oldest girls. We love AiG! And would be interested in any age, but particularly jr high! I have been looking for a Bible curriculum, would love to try this out! I love Answers in Genesis!!!! Grades 5 & 6 would be best for us. We’d love to use this to deepen our Bible study as a family! I would use it along with “My Father’s World” curriculum that as are using! We would love to get the preschool printed kit! I love AIG and have purchased both science and history from them for the upcoming year. I would love preschool or grade 5-6. 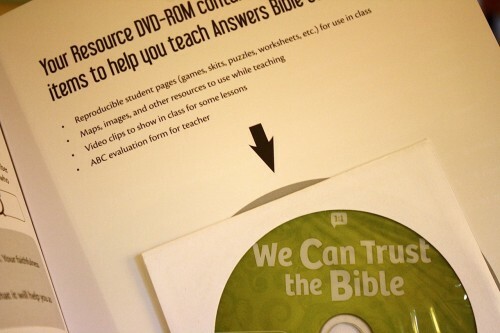 We would use it as a teaching tool and Bible study tool for homeschool. I would love to win this………..our daughter is going to be a senior and would love for her to use this to finish up her school. I would love this for both of my boys..but I do need something for my 9th grader most. I have been looking at this for awhile. What a blessing it would be to win! Our church has the “We Can Trust the Bible” DVD-ROM but every time I try to go into it to download activity pages it will not let me. The only thing that comes up is videos. Any suggestions? I like to add some Bible to our homeschooling and I couldn’t find anything for my 10 year old son. We ordered just the take home sheets for 5th grade Answers Bible Curriculum and he loves it. We do it together too! That way I could add in the irrefutable proof of God by prophecy. We like it a lot! He’s always excited to do it. I’ll have to check out the high school stuff. Thanks for the review! We use ABC in our Sunday school from PreK-Adult. We have found that the High School and Adult lessons are extremely weak in the application sections. In fact, we stopped using the curriculum in our High School class because the lessons consistently fell short in the practical outworking of the biblical material. I’m curious to see a review of the new 2.0 curriculum because we love AIG.